Korean cellphone maker Pantech has released the Vega IM-A650S Android smartphone, as the follow-up to the SIRIUS IM-A600S. The lightweight Vega sports the 1GHz SnapDragon processor and runs Android 2.1 OS with the Real 3D Home UI. It also features mQSynth and mQFX from QSound Labs. It comes with a 3.7-inch 800×480 AMOLED capacitive touchscreen, 500MB internal memory and a microSD card slot. The Pantech Vega weighs just 114g. It is available in black, white, brown and gold. QSound is a global supplier of audio software technology for mobile devices, headphones, Bluetooth devices, televisions, stereo PC multimedia equipment and other consumer electronics. QSound’s proprietary audio algorithms truly deliver a fuller, more natural and immersive audio experience - users hear the difference!! QSound’s sonic technologies, algorithms and special effects include: polyphonic wavetable synthesizers, 3D (three dimensional) audio, multi-speaker system surround synthesis, virtual surround sound capability, 3D sound stage expansion, 3D positional audio, low/mid/high frequency spectral enhancement, reverberation, dynamic range control, equalization, and anti-saturation among others. Today, QSound’s microQ® technology is rapidly becoming a standard in the mobile and handheld device marketplace. Whether it is to enable the phone to ring using microQ’s mQSynth™ or enhancing the music listening experience with microQ’s digital audio effects mQFX™ or enticing interactive gaming with mQ3D, microQ is the leading mobile audio solution. 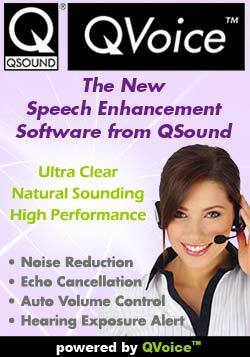 QVoice™, QSound's new speech enhancement software is a feature-rich noise reduction and echo cancellation software solution for mobile phones, hands-free car phone systems and headsets. With additional features like noise-dependent volume control and hearing exposure monitoring, QVoice offers the most comprehensive, highest quality voice solution currently available on the market. QVoice can also be bundled with QSound’s mQFX 3D audio effects suite, offering OEMs of Bluetooth® enabled products a complete voice and music enhancement Wireless Audio Solution all in one package from a single vendor. With over 20 years proven expertise in digital audio processing, QSound Labs is the only software developer able to provide a full range of voice and audio solutions for mobile devices. Other QSound technologies have been used to enhance video games, movies, television programs, streaming Internet audio, MP3s, CDs, DVDs and more. QSound's 3D positional audio and virtual surround sound technologies power the QSound branded products QSurround®, QHD®, QMSS™ for consumer home entertainment products and Q3D Interactive® for video gaming. QSound continues to develop, refine and deploy the most effective audio solutions available for an ever changing marketplace, as newer and more innovative consumer products requiring increasingly advanced audio technologies emerge.